Since nearly everyone suffers from a pimple outbreak at some point in his or her life, we wanted to give you the tools to combat it naturally with essential oils. First we'll talk about why it works and then we'll get to the remedies. Or, you can peek at the flip cards like the one below. Up to you. We're cool like that. Acne has four main causes. The most common cause is clogged pores. When we have greasy secretions from the skin's sebaceous glands (oil glands) it plugs the tiny openings called pores, or hair follicles. In larger pores the clogs take the form of blackheads, while the small pores form flat spots with dark centers. If the opening stays small, the clogs take the form the small flesh-colored bumps we refer to as whiteheads. Both types of plugged pores can develop into swollen, tender inflammations called pimples and sometimes deeper lumps or nodules. Nodules associated with severe cases of acne (cystic acne) are firm swellings below the skin's surface that can become inflamed, tender, and sometimes infected. Acne is most prevalent amongst teens, about 80%, while 20% of acne sufferers are adults. For many, acne first appears during the teenage years and usually (but not always) goes away by young adulthood. For some, it is a continuing condition. Young or old, acne is no respecter of persons; under the right conditions nearly anyone can be affected. With over three million reported cases per year, it’s not surprising that there are so many acne-fighting products out there vying for your dollars. Despite the claims of these products, there are healthier ways to combat acne. For women, hormonal changes during pregnancy and while using oral contraceptives also affect sebum production. The low amounts of androgens circulating in the blood of women can worsen acne. Certain medications. Examples include drugs containing corticosteroids, testosterone, or lithium. Diet. Studies indicate that certain dietary factors, including skim milk and carbohydrate-rich foods such as bread, bagels, and chips may worsen acne. Chocolate has long been suspected of making acne worse. A small study of 14 men with acne showed that eating chocolate was related to a worsening of symptoms. Further study is needed to examine why this happens and whether people with acne would benefit from following specific dietary restrictions. In search of a more holistic approach to acne treatment, people are reporting impressive results using more natural, homemade remedies. Given that we live in an ever more health-conscious society, the Organic Daily Post wants to offer our readers some natural alternatives to those chemical-based prescriptions and over-the-counter (OTC) acne medications. Essential Oils (EO) are growing in popularity with their seemingly unlimited uses - more being discovered every week. Through ongoing research into the chemistry and therapeutic opportunities that essential oils offer, more doors are opening to holistic treatment. The problem with growth and popularity is that there is little proper guidance on how to use these wonderful oils safely and effectively. We’re here to change that for you. This article will show you how many people treat acne and dry skin with essential oils. You’ll also discover that you don't need to resort to harsh chemicals to have a clearer complexion and softer, smoother skin. Using essential oils and complimentary carrier oils, you too can have healthier, more vibrant skin. You will need to choose essential oils that are skin friendly and I’ll use complimentary carrier oils as well. Carrier oils also have therapeutic actions and, alongside the right essential oils, they can make a big impact on your skin. When it comes to combating acne and other epidermal issues, there are countless essential oils and carrier oils that can be used. The following are some (but by no means all) essential oil options that can be used. Important Note: When choosing essential oils, they must be free of impurities including synthetic ingredients to be effective. Always check the gc/ms analysis reports from your company. Reputable companies will have these reports on site and readily available or will gladly email them to you. If they do not release the reports, I would be hesitant to use the company. For aromatic therapeutic treatment to be successful, the oils must be pure and unadulterated. TEA TREE OIL IS GREAT for acne because it contains natural germ-fighting properties called terpenes. The terpenes present in tea tree oil offer excellent properties for acne because they are a stimulant for the immune system, antibacterial, decongestant to the skin, antihistaminic, anti-inflammatory, and also a vasodilator. We love tea tree oil because it offers emotional support and teens especially need that extra boost. Coconut oil is one choice as a carrier. Coconut is comedogenic, meaning it can clog the pores and cause acne. However, if used with other carriers it is also conditioning, a skin protectant, and wound healing. I like it because it helps keep other carrier oils from going rancid. My next choice for a facial carrier would be kpangnan (pronounced like pon-yah). This carrier oil is remarkably more moisturizing than shea butter and when applied to the skin, it has a slight warming effect. Studies have found that kpangnan contains a high amount of stigmasterol, an unsaturated plant sterol that contains anti-inflammatory and analgesic agents. Organic and unrefined kpangnan will give you the best butter for skin preparations. As soon as it is refined it changes its wonderful skin healing properties. The butter should be hard and yellow. Blend. Using a cotton ball, squirt on and dab on skin. Let the solution air dry. Everyone’s chemistry is different. We react differently. This works for most people, you may be more sensitive. If you have any itching, redness or swelling, stop treatment. LAVENDER OIL IS A FAVORITE essential oil to many people for many reasons (buy it here). Not only does it have a clean and sweet fragrance, it's also beneficial to your skin. Blend, shake and apply to face. Without a preservative, it will keep in the refrigerator for up to two weeks. To help your product last longer, consider using a preservative for skincare products. An example of a good preservative can be found here. For scars, I like tamanu oil as the carrier. Its aroma is a bit stronger, but it’s perfect for healing skin and compliments skin healing essential oils perfectly. Tamanu is used for treating scars, stretch marks (fades stretch marks with great results), minor wounds, skin irritations, rashes, bedsores, and many other skin concerns. It promotes new tissue formation, accelerating healing and healthy skin growth, is an anti-inflammatory, antibacterial, and antifungal. After cleansing face, apply treatment where needed. Using 3-4 times a day is best, especially when using on clean, warm skin. OREGANO OIL IS ANOTHER essential oil that requires caution when using but if used wisely is a very beneficial oil. Oregano is a great treatment for acne and other skin infections. It’s anti-bacterial, anti-inflammatory, and stimulating. Although it’s recommended for healthy adult skin at a maximum of 2%, Tisserand does state that a lower concentration is advisable because oregano is hepato-toxic in large doses. My recommendation is a 1% blend. Oregano has a bit of an herbaceous pungent aroma. Oregano essential oil has the component carvacrol in it, which can be highly irritating. If not diluted properly, it can cause a reaction and should never be ingested. It should not be used on children younger than two years of age. My personal suggestion is no younger than 5 years of age. Do not ingest this oil. Add to small bottle with squirt top. Using a small amount, apply to skin. ROSEMARY ESSENTIAL OIL IS GOOD for both oily and combination skin. There are two other types, verbenone, and cineole. We are discussing the camphor chemotype. The cineole and verbenone are NOT suggested, as these two chemotypes are untested oils and should be avoided on skin. Rosemary ct. camphor assists with acne. Because it has stimulating properties, especially to the circulatory system, this works great to stimulate the skin. It’s mood lifting and awakening. We would not suggest rosemary at night since it is stimulating - highly so in larger doses. Rosemary builds and regenerates connective tissues. (6) It reduces the natural oils the skin produces as well as the swelling and puffiness that can accompany breakouts. Rosemary improves bloodstream circulation and is a natural astringent. Avoid use with epilepsy, pregnancy, or high blood pressure. May antidote homeopathic products. Directions: Great on a cotton ball to spot treat closed and healed acne wounds to help heal scarring. GERANIUM OIL is another skin healing oil (cicatrisant). 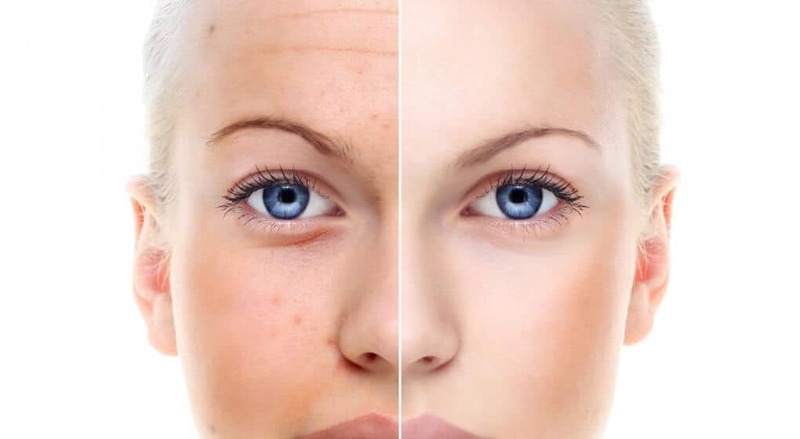 It does this by regenerating damaged skin cells. It’s anti-inflammatory, and the hydrosol is perfect as a skin healing tonic. It works as an analgesic and as a bonus for the teens and hormonal times it also has anti-depressant properties. Blend 9 drops of geranium essential oil with 1-ounce of aloe vera and apply it at bedtime. This is best kept in the refrigerator. This will preserve it and give a cooling effect to inflamed skin. Roman chamomile is excellent for skin disorders, especially during the menstrual time of the month. Along with assisting skin disorders, Roman chamomile is excellent for emotional calming, supportive, and reduces stress. Along with the essential oil, Roman chamomile hydrosol is wonderful as a skin toner. After washing your face, simply spray the hydrosol on your facial skin for a refreshing, cooling, and healing treatment. Hydrosols are often available through essential oil companies. Some beautiful hydrosols can be purchased at Stillpoint Aromatics and Nature’s Gift. Calming clary sage essential oil has shown to be effective in relieving anxiety and reducing stress. PRO TIP: Add 2 drops of eucalyptus to a steaming bowl of water. Cover your head with a small towel, like a tent. Close your eyes and steam your face, breathing deeply as you do so. Pat your face dry. This will open the pores on your face and your sinuses. LEMON OIL HELPS CLEAR UP acne by balancing the sebum. It acts quickly to restore your skin’s natural balance. To help against future outbreaks, lemon boosts protection against bacteria and infections. Lemon essential oil also has shown to tighten the elasticity of skin, tighten blood vessels, and improve the skin’s circulation. All of this helps to achieve healthier acne free skin. MYRRH OIL is known as the complexion oil. Myrrh is a great skin healer and cicatrisant; it helps regenerate skin cells and heal scars. Regaining clear skin after suffering from acne is important, especially to teens. Myrrh is an astringent and has a warming effect. For those serious acne wounds, once wound has closed and scabbed over, add a blend of myrrh, lavender, German chamomile, and tea tree at a 1% (total of 9 drops of blend) to tamanu oil and apply up to three times a day. Stop treatment immediately if irritation occurs. COCONUT OIL IS REALLY GOOD for you (inside and out) and, along with previously mentioned carrier oils, can be used in combination with these oils and in the recipes found below. However, coconut oil can be drying for some people. It that case, opt for Babassu Oil. It is interchangeable with coconut oil in most recipes as it is just as moisturizing and nourishing. It is an especially beautiful restorative agent for the skin and scalp. The oil readily melts at body temperature, such as when rubbed onto hands; it is soothing, acting as an emollient. JOJOBA OIL is often chosen as a carrier oil for skin products. Jojoba protects the skin but allows it to breathe. It helps control acne and is a wonderful anti-oxidant. Carrier oils are used to dilute essential oils when using them topically. As you can see, there are many choices available when it comes to which essential oils to use for acne and it really depends on your specific situation and fragrance choice. Further research will guide you toward the best essential oils for your skin condition. PRO TIP: It is important to learn the underlying causes of your acne to determine the best treatment. Essential oils alone cannot cure acne. Using skin friendly safe oils, dilute according to the individual suggested dermal dilution rate per oil. Dilute the essenti﻿﻿al oi﻿﻿l(s) with a carrier oil, such as jojoba. Some other carrier oils to consider are aloe vera, apricot kernel CP (cold pressed), argan, babassu, baobab, calendula infused organic oil, cranberry seed organic oil, marula oil, pomegranate oil, and rose hip oil to name a few. These are all skin loving carrier oils. Prior to using any essential oils, check for any safety concerns. IF YOU ARE UNCERTAIN, use the newly diluted solution to perform a patch test on a small area of skin first. Apply a small amount on the inside of your forearm. If you do not react within 10 minutes, it should be safe to use your blend. Anytime you have a reaction, stop use and apply lotion or soap over it, wipe off, then rinse off. Do not use water to try to wash of oils. Many oils do great alone, but some are supportive of other oils by enhancing penetration or giving a greater balance in the chemical composition. Using synergistic blends can be even more healing than a single oil. You can use either lip balm tubes or small tin containers. We’re going to use a combination of carriers. Coconut oil will be one, but along with all the delightful aspects of coconut oil, there is the downside of using it on our skin. Coconut oil has traditionally been given a comedogenicity rating of 4 on a scale of 0 to 5 with 5 being the highest. Comedogenic means pore clogging and likely to cause acne comedones (AKA, pimples). However, everyone’s skin reacts differently. Since it does have benefits, you can use it at a lower dilution with other carriers. The attached video that I did is for salves. However, it’s such a beautiful thick recipe, you can also use it for making blemish sticks. Simply replace with the below-suggested oils in place of the oils I use in the video. For your blemish stick, you could use equal portions of tea tree, lavender, and frankincense to equal the amount mentioned in the video. The video recipe calls for a large batch but you can downsize it, remembering that if you cut the recipe in half, be sure to not only cut down your carriers but your essential oils as well. Use at night on blemishes that are inflamed. Blend and, using your own washing method, cleanse face and rinse thoroughly. Pat dry. Follow with your acne moisturizer and blemish stick where needed.